Anyhey, after you've savoured the loading and intro screens it's into the game proper. 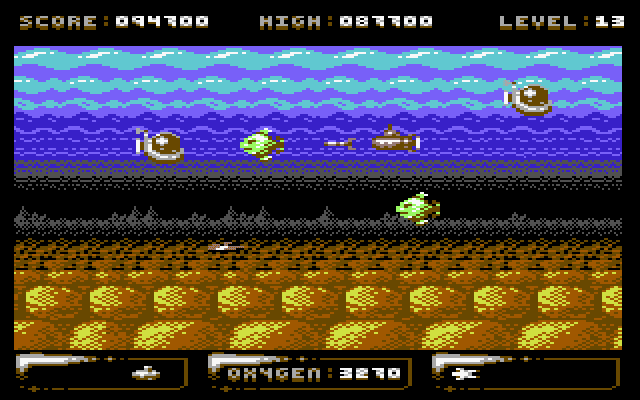 Gameplay is split into several wave types, but all the time your objective is to either rescue the aforementioned hapless swimmers or protect them through more indirect means. 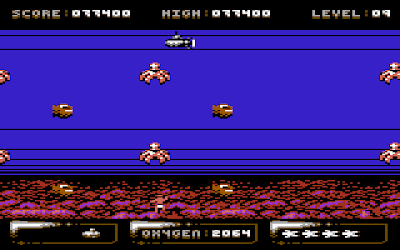 A lot of the action happens in a side-scrolling shoot 'em up where you'll have to torpedo your way through sharks, jellyfish, enemy subs and many other threats whilst also staying alert for the swimmers that appear every so often. Rescue enough and the next wave beckons, but don't take too long or your sub's oxygen supply will run out, losing you a valuable life. 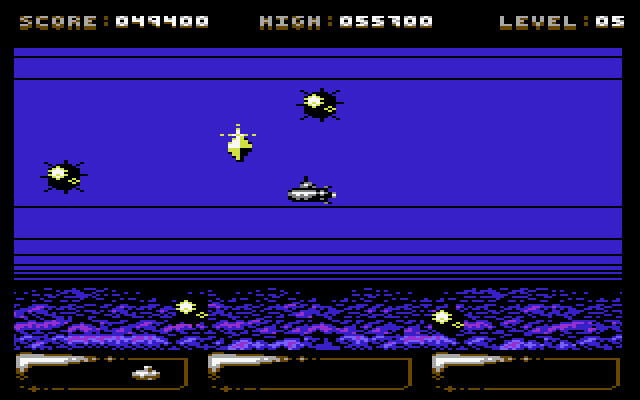 The second wave style sees your sub fixed at the top of the screen while you fire vertically down at various nasties that patrol the seas below. Here you're aiming to eradicate enough targets so that a swimmer can safely make his way across the screen - if you fail to blow enough things up before the timer has ticked away then your swimmer will instead suffer a horrible fate and, as satisfying as that outcome might be, you'll lose a life for your failure. Initially you need only rescue one swimmer, but later waves require you to do this several times. After doing all this you'll probably end up reaching a stage that involves playing dodgeball around enemies. You gradually descend to the seabed where a swimmer has fallen and lies flapping about helplessly - once you pick him up, your sub starts rising and the rescue is complete upon getting back the ocean surface. 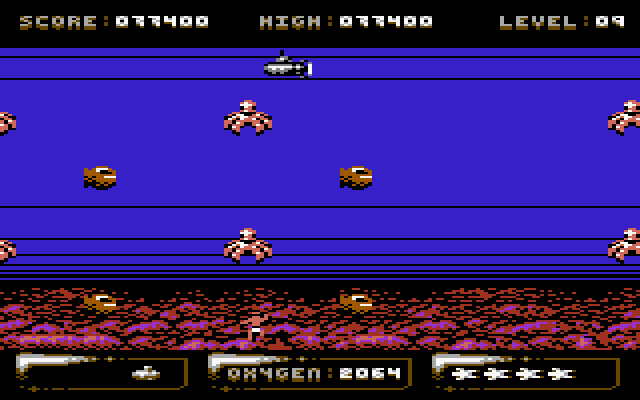 Since your torpedo tubes are disabled, timing is critical if you are to keep hold of your lives, and just to make sure you don't keep your happy flappy swimmer chappy waiting too long, the oxygen timer reappears to hurry you along. Low on lives? No problem. There's a bonus round every so often, giving you the chance to rack up a few more points and maybe get an extra life if you survive all the way through. 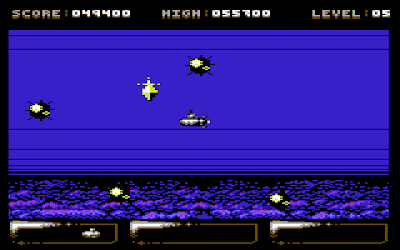 Dodge the bouncy mines and collect crystals as you go, but you'll need to have pretty quick reflexes to avoid getting sunk as your speed increases to quite intense levels. Altogether Sub Hunter plays well and there's not a rough edge in sight. Be warned, however, that it certainly leans toward those who enjoy a challenge - beyond level 10 things get quite unforgiving. This type of game isn't usually quite my hammer, but nevertheless I can appreciate the work that's gone into making it a quality production. The music throughout is great with a couple of tracks by Richard and the others coming from Thomas Mogensen (better known as DRAX of Maniacs of Noise). I've yet to hear a bad tune by DRAX - but if you still prefer to have sound effects, well, you can turn them on in place of the music. 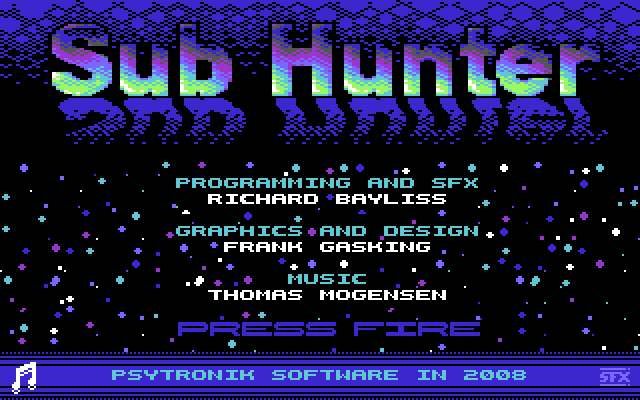 On the visual side, it surprised me a little to read Sub Hunter's artist modestly say on the C64 Scene Database that the graphics don't do anything especially new or exciting. Maybe so, but it's extremely hard to push the envelope these days. The sprites and animations are crisp and the multi-layer parallax scrolling gives a nice sense of depth to your aquatic adventure. The only really bad thing is that it's occasionally a bit difficult to pick out the action against some of the brighter backgrounds, but I didn't find this hugely awkward. 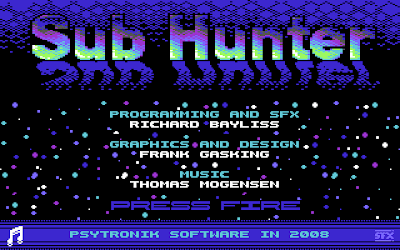 With a whole slew of DVD-style extra content included on the deluxe disk version, Sub Hunter is a credit to the scene and a testament to the C64's enduring spirit - games of this quality aren't a regular thing so when they do come along, they deserve as much support and encouragement as us humble retro fans can give. Whether you play it emulated or on the real thing, you're sure to have some good gaming time ahead. Download it here (from the Commodore Scene Database). Run it using VICE (free software).